Many localities set aside a "small" amount of money for each council district for local projects. Typically, the monies are allocated by the councilmember. Participatory budgeting is a different method, where citizens get together and through an organized process, set the priorities and pick the projects to fund. I think this is a great method, because it adds a great deal of openness and transparency to the process, when typically such grants come as a result of connections, as a way to help foster incumbency, and in murkiness. New York City is one place where Councilmembers have the option of having funds allocated through participatory budgeting methods, and this year 27 of city's 51 districts are participating ("City Council program lets you choose what public projects to fund in your neighborhood," AMNew York) for a total allocation of about $30 million. Some Chicago Alderman also use participatory budgeting, and some cities, like San Jose, are experimenting with the process both city-wide and at the district level. 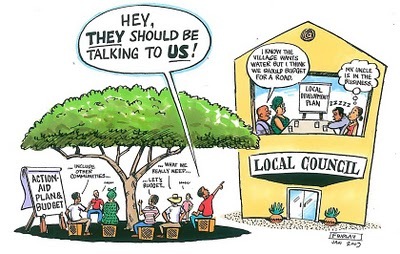 I've also argued that the city Attorney General should use participatory budgeting, really it should be called "participatory allocation" as a way to distribute money from settlements to "worthy projects" ("Participatory "budgeting" and disposition of funds from legal settlements," 2015 ), rather than solely to groups with special connections to the AG.